Creamy oil free dressing compliments almost any seafood dish. 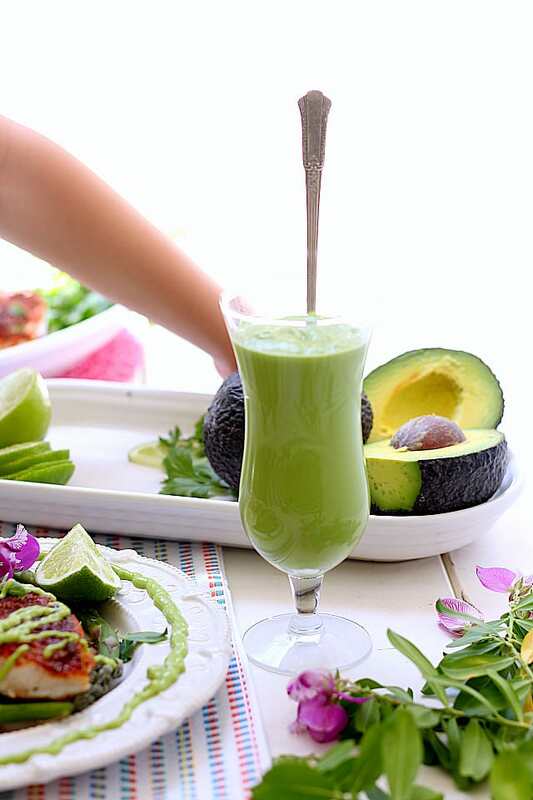 Drizzle this creamy avocado fish taco sauce on tacos, fish, poultry, pasta or salads for a punch of zesty healthy flavor! Hope you all are having an amazing weekend! Sundays feel like the recovery day after busy family Saturdays and a hard work week. It’s fun to take the weekend to play at the beach, go for a hike, and just be a family together. Although this past weekend we worked more than played. My husband and I have a fun project happening behind the scenes of Delightful Mom Food, and I can’t wait to share it with you! But sorry, not quite yet:-) Anyways, back to weekends. The weekends are meant to recharge from some of life’s challenges and eat delicious food like this fish taco sauce on crispy tacos! 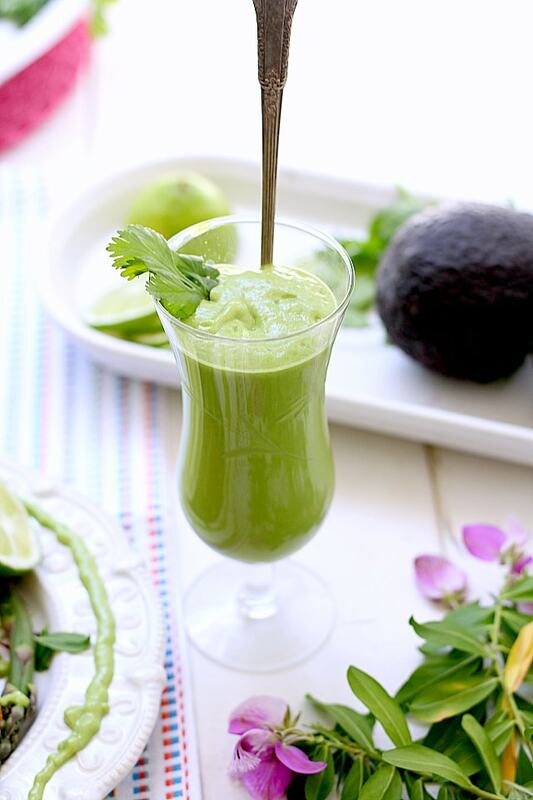 Made of avocado, cilantro, lime juice, Greek yogurt and a sprinkle of salt to compliment your favorite dish. This past week has been a real challenge with my four year old. My four year thinks the world revolves around him. Our past week was a week of trial and error and buckling down on the rules. Lots of time outs, conversations and screams based on “Just Listen When You Are Asked To Do Something.” Getting dressed and getting out the door is such a draining hassle – I dread it. As parents we sometimes do too much for our children which can hurt them in the long run. Why wouldn’t you? It is faster, easier and we actually get out the door or to bed if I get their shoes and clothes on for them! But children start to think they are incapable of doing even the simplest tasks if you take over too much (I am slowly learning this). After following through with my word as a parent I think we had a breakthrough together. And that meant sitting there with Chase for a full hour forcing him to clean up a mess he made. Tears were shed for the full hour but the important message was to “follow through, you can do this.” We proceeded to do the same for getting dressed in the morning and before bed. It only took a couple of tries to encourage him that he is capable of any small task. And now we can occasionally get out the door on time:-) And I can proceed to the kitchen. Some days when I ask Chase to help me in the kitchen he says “he can’t, he’s too busy.” I think that is a four year old term for “I don’t know how or feel confident.” So we blast some music and create the impossible (in his mind), together. He dresses up dinner with sauces and garnishes, mixes ingredients, and now has the chore to set the table. Kitchen time is our memorable family time. Chase picked dinner out on Thursday evening. He is my extreme seafood lover so we made blackened rockfish and topped it off with this amazing fish taco sauce. This sauce would be just as delicious on cod, salmon, lobster, tilapia, shrimp or steak filet fish such as halibut and swordfish. 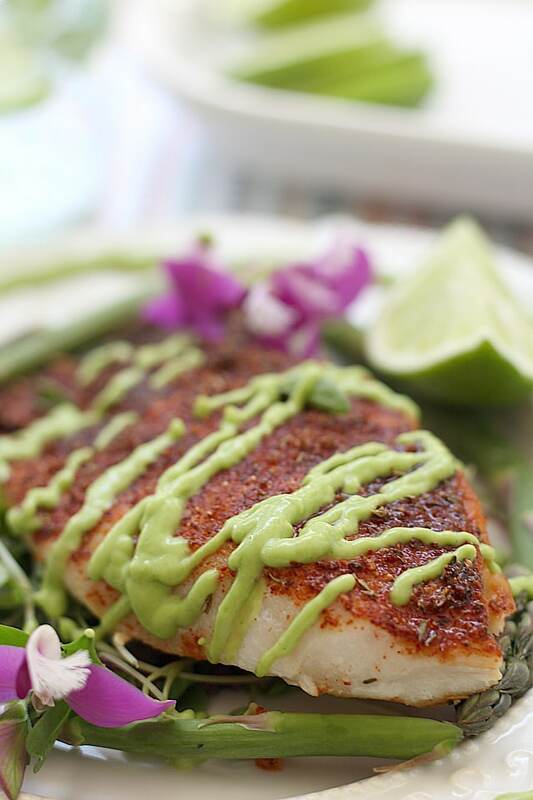 Our rockfish was just begging for this creamy avocado and cilantro dressing to add some pizzazz to it. 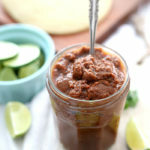 It is just as good as this southwest dipping sauce and is perfect on your favorite seafood recipe and fish tacos. We make tacos A LOT. Vegetarian tacos, Greek tacos, chicken tacos, fish tacos, quinoa tacos- you name it, we eat it! A taco, wheat or corn tortilla deliciously folded and stuffed with filling is our favorite quick and easy dinners. It’s effortless and cheap to make. I have been wanting to make a creamy oil free salad dressing for a while now that could be used as a dip or sauce for our tacos. 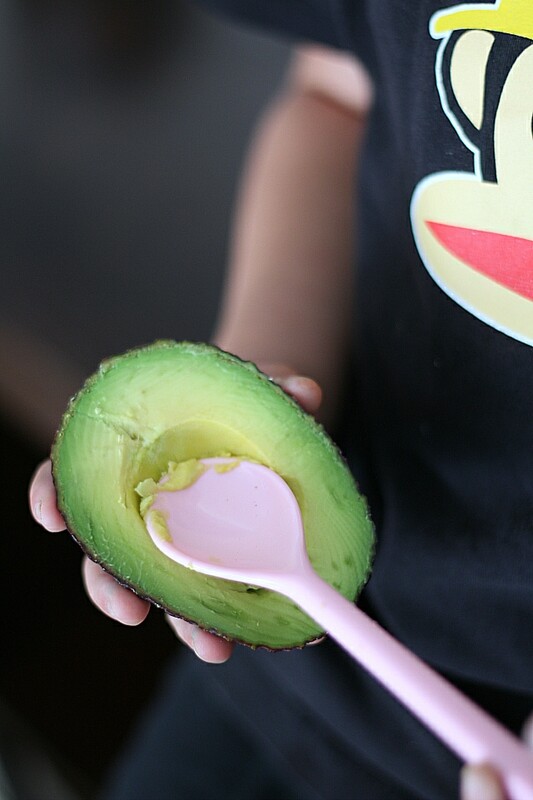 Curren loves to eat this avocado fish taco sauce with a spoon like a bowl of pudding. So I had to make a giant batch! Chase put the cilantro, lime, garlic and salt in the blender and helped me to drizzle and dress our fish dinner in the avocado cream sauce. I think you will just love this fish taco sauce recipe! 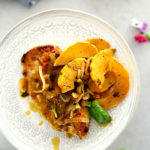 It is so healthy and easy and tastes great on anything. Spread it over toast, quinoa bowls, rice, as a salad dressing or dip for chips and fries. 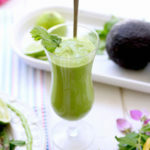 I make my version with lots of lime and use less salt. Add a splash of chipotle or habanero for a bit of heat if you choose! Creamy oil free dressing compliments almost any dish. 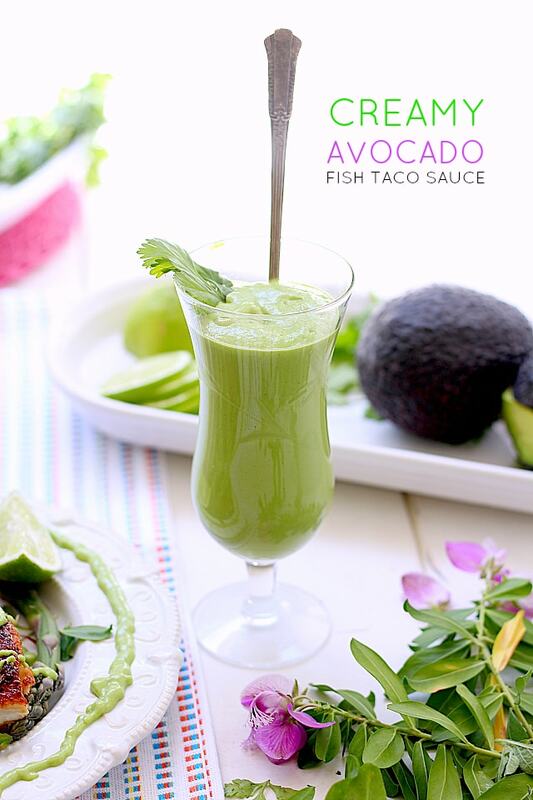 Drizzle this creamy avocado fish taco sauce on tacos, fish, poultry or salads for a punch of zesty healthy flavor! 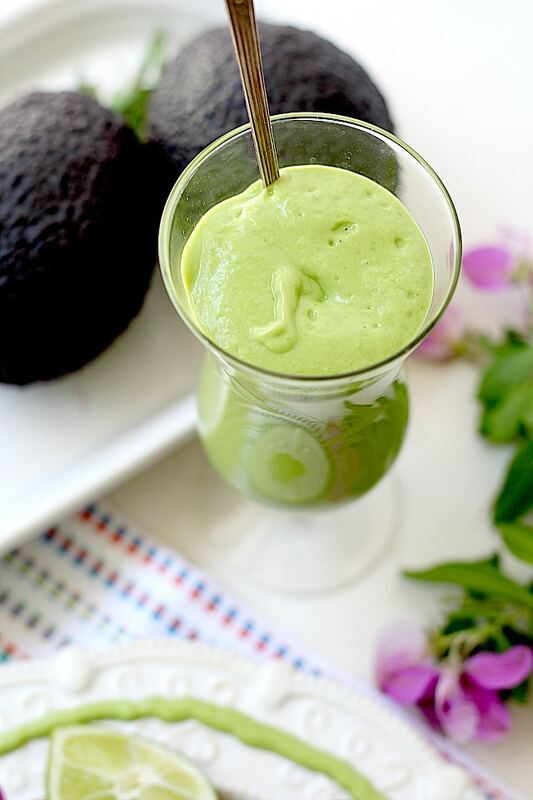 Blend all ingredients in a blender or food processor until smooth. Serve over fish tacos, blackened fish, or salad.